At the end of April, my friend/Lil Sister posted a picture of her Wreck This Journal on Facebook. I mentioned how I had a copy but wasn’t sure where it was – maybe I needed to dig it out and work on it. I’d written about it last summer when we were in Liverpool after I bought Living Out Loud from Waterstones after dragging the boys in there so that I could spend the gift voucher that I’d won. After Lil Sister and her Mum popped by on Tuesday to say hi (And for a mini Baby Shower as they can’t come at the weekend), I remembered where my copy was. I pulled it off the book shelf and we had a flick through. Yesterday I started working on some more of the pages. Some of it was just a case of adding more to each page and some was about starting new pages. While chatting to Lil Sister – we ended up talking about chromatography and science lessons, I remember using Smarties or Skittles and water to then get the colouring to bleed into filter paper and it then ends up separating into the individual colours. As it happens I had a bag of Skittles in the house so decided that an experiment was needed for this page. I grabbed the Skittles and spread them across the page, then got a syringe that I had in a craft kit to drop the water onto the Skittles. I then left them and went off to do other bits and pieces. When I returned some of them had worked better than others, the red and the purple were really vivid but the yellow and green weren’t working so well. I had done the cover when I first got the book, I think it might need some bits adding to it and some tweaking. I used various bits of magazine and newspaper but I think it needs something else (and cover the Ikea logo lol). 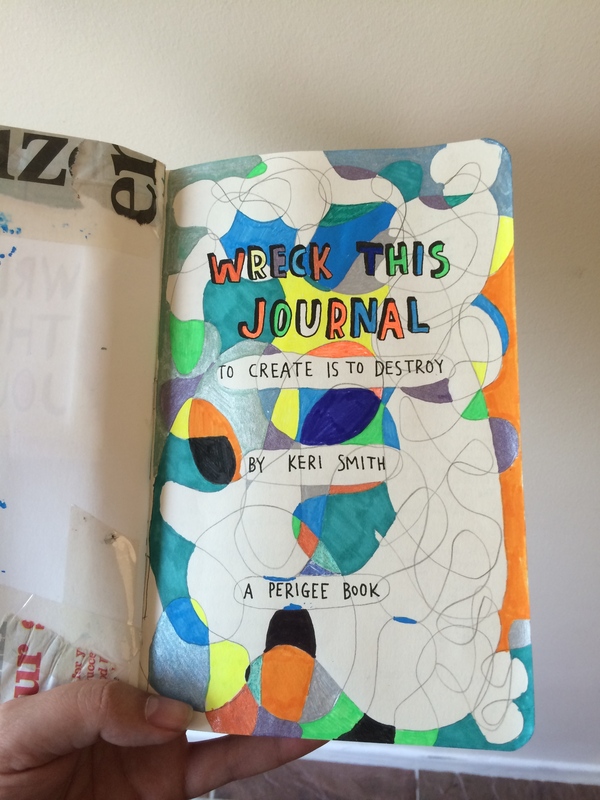 This entry was posted in Knitting, Crochet and Arty Bits and tagged Wreck This Journal. That looks like a fun, creative exercise! I love the bit with the Skittles. Of course, you had to eat a few in the process, right…? Of course! I figured the ones on the page had only been in contact with the page, water and the packet so ate them too!